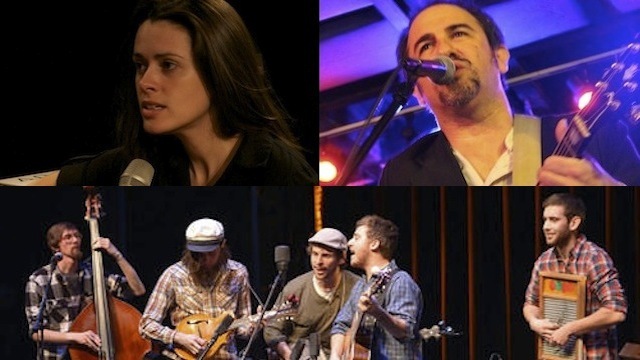 On April 9 On Your Radar at Rockwood Music Hall featured Caitlin Canty, Jon Shain, and Poor Old Shine. Caitlin Canty hails originally from Vermont, but moved to New York City after college to pursue music as a career. In addition to her own two full-length CDs, her side projects include Darlingside, a string rock band, and the duo Down Like Silver with Peter Bradley Adams. One song she performed,"Still Here," is the lead track from her 2012 CD, Golden Hour. Jon Shain has developed and refined his own contemporary version of the Piedmont Blues in his adopted hometown of Durham, NC and elsewhere around the region. He led off his set with the title track of his most recent CD, "Ordinary Cats." Poor Old Shine is a high-energy string band from Storrs, CT, whose members discovered a common love of Roots/Americana music while students at UConn. They were voted Most Wanted at the 2012 Emerging Artist Showcase at the Falcon Ridge Folk Festival. "Footsteps in the Dark" is part of a medley they performed at On Your Radar. More info about On Your Radar.